It's tough to find creepy songs to play on Halloween. It's even harder to find ones that aren't just novelty hits with lyrics like, "I said, 'Mr. Purple People Eater, what's your line? '/He said, 'It's eatin' purple people and it sure is fine'." But toughest of all is finding a good greatest hits album. 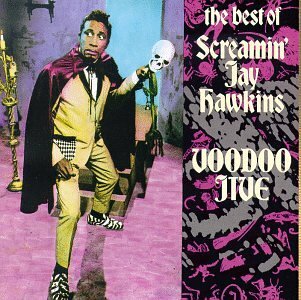 Somehow, Screamin' Jay Hawkins' Voodoo Jive: The Best of Screamin' Jay Hawkins manages to accomplish each. Hawkins was born Jalacy Hawkins in Cleveland, Ohio in 1929. He wanted to become an opera singer at the beginning of his career, but when that didn't pan out, he started singing the blues. Before long, he was creating murky, swampy songs that, in concert, would be accompanied by on-stage props like snakes, shrunken heads and a cigarette smoking skull called Henry. Hawkins also made his roadies drop "worms" on the audience's heads (although the worms were really only rubber bands). Although generally considered as a novelty act, Hawkins was actually quite talented. Try listening to "Alligator Wine," "Little Demon," "I Hear Voices" and, with all due respect to Nat King Cole, the best version of "Orange Colored Sky" out there, and you'll soon hear a fantastic mix of Paul Robeson and Fats Domino. Outside of his eccentricities, Hawkins is sadly known mainly for his single, "I Put a Spell On You," which is included on Voodoo Jive. If you've ever seen Jim Jarmusch's Stranger Than Paradise, you know "Spell" because it's played nearly as many times as Bruce Springsteen has sung about cars in his career. The song has been covered or sampled by everyone from Creedence Clearwater Revival to Notorious BIG. The best track on the album is "Constipation Blues." If you can't guess what the song is about from the title, maybe this'll help: "Got a pain down inside/Won't be denied/Yeah, every time I try/I can't be satisfied." This song would be at the top of my list of "Songs about Poop." If that's not enough, Hawkins, who passed away in 2000, is thought to have 75 children and has an album called Black Music for White People—a number and title that are scarier than any Halloween outfit us non-Screamin' people could think of.